Statue of the emperor August. 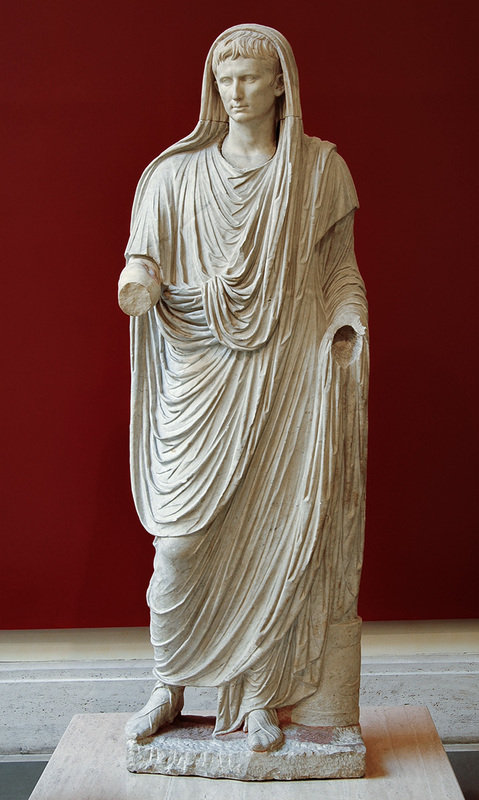 The statue of Augustus as Pontifex Maximus emphasizes the pietas of the ruler and his reverence for the ancient gods and traditions in a classicizing style that is typical of his reign (27 B.C.—14 A.D.). Octavian, the son of a knight and a nephew of Julius Caesar, came to power in 31 B.C., after defeating Anthony and Cleopatra at the battle of Actium. In 27 B.C. he assumed the title of Augustus and presented himself to the Senate as saviour of the country and to the people of Rome as a new Romulus, founder of a new age. An important aspect of his reforms was an emphasis on Roman ancient moral and religious values. Augustus thus revitalized the role and function of the most ancient Roman priesthoods and exalted the myths that narrated the origins of Rome.